Texas rock quartet NOTHING MORE has announced a 2018 extension to its current U.S. headline tour, which sees the band — frontman Jonny Hawkins, guitarist Mark Vollelunga, bassist Daniel Oliver and drummer Ben Anderson — headlining venues from coast to coast. A special BLABBERMOUTH.NET presale for select dates (see below) will begin on Wednesday, September 27 at 10:00 a.m. local time and end on Thursday, September 28 at 10:00 p.m. local time. When prompted, type in the presale code “BLABBERMOUTH” to access tickets before the general public. The general on-sale is Friday, September 29 at 10:00 a.m. local time. NOTHING MORE‘s live show is a sight to behold; it features a 400 lb., 14-foot-tall instrument made from scrap metal, automotive and motorcycle parts. The instrument was hand-crafted by Oliver, a self-taught welder and metal artist. It looks and sounds like nothing you’ve come across and must be seen to be believed. 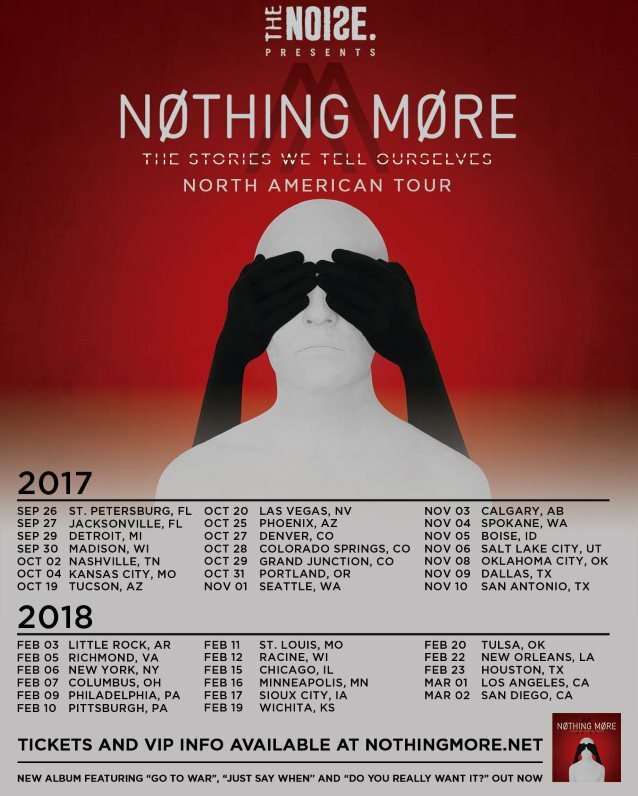 NOTHING MORE‘s new album, “The Stories We Tell Ourselves”, was released on September 15 via Better Noise Records. The disc sees frontman Jonny Hawkins once again bearing the soul of NOTHING MORE as his bandmates Mark Vollelunga (guitar), Daniel Oliver (bass) and Ben Anderson (drums) craft a sonic palette comprised of elements ranging from progressive metal to pop. The songs on “The Stories We Tell Ourselves” were written early last year and recorded primarily on the road and in personal studios as production duties were often handled by Hawkins and the bandmembers themselves. From the relentless groove of “Don’t Stop” to the emotive, anthemic bent of the PIXIES-esque “Still In Love”, “The Stories We Tell Ourselves” proves that confessionals have never been so catchy — and songs like “Let ‘Em Burn” seamlessly alternate between aggression and anthemic pop. Lyrically the band was further informed by everything from the writings of Carl Jung and C.S. Lewis to the potent psychedelic DMT, the latter of which helped open Hawkins‘s mind to new ways of understanding himself and the world around him.